I had a lovely visit with extended family this past weekend, and I am so thankful to have been the recipient of some lovely gifts. Renee @Quilts of a Feather got together to split our shared purchase of Denise Schmidt solids from Massdrop, and she gifted me a lovely mug rug and needle minder. My special binding whip-stitch needle now has a perfect new home, so hopefully I will not lose it in the future! My mother-in-law also found some batting at a local yard sale and gave it to me. 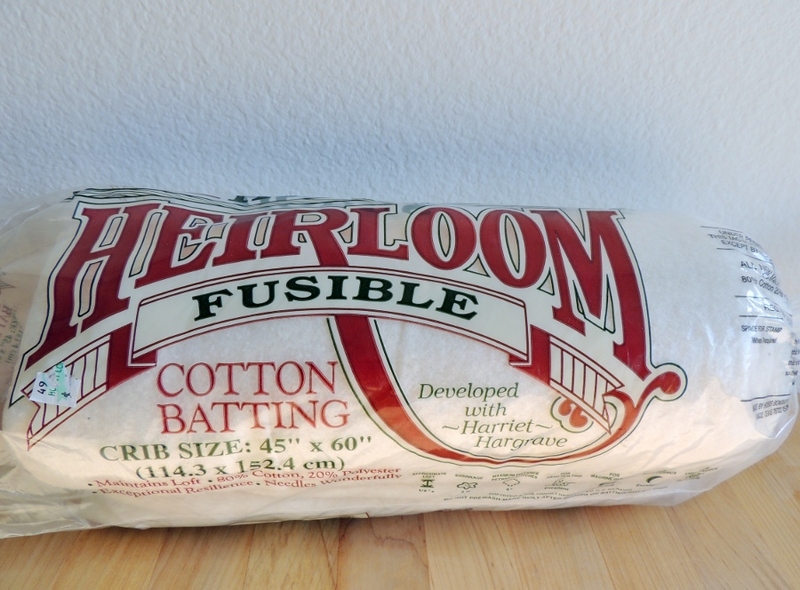 I am intrigued by this fusible cotton batting and looking forward to giving it a try! The needle minder and mug rug are really sweet. What a great reminder of a quilty friend! Looking forward to hearing about your experiences with the fusible batting. You have the perfect teacup for it! I only have big mugs (the bigger the better), and thought about making a few of the teacups without a saucer because I have never in my life owned one (although I will be inheriting an entire set from my grandma soon). Renee picked the perfect fabric for your mug rug Yvonne… she must know about your gorgeous blue accented kitchen. And that is so sweet that she made you a home for your beloved binding whip stitch needle. People like that are something wonderful to be thankful for! The fusible sounds really interesting. I look forward to hearing what you think. Today I am especially grateful for my boys. They keep me busy, and make everything worthwhile. That was such a thoughtful and lovely gift! I love it! Looks perfect with your cup of tea on it, too! I’m jealous of your MIL, she seems to find you some great finds! What a lovely, thoughtful gift. I’m thankful for an almost reorganised sewing space at the moment, it’s still slightly in that worse before it’s better state but once I get finished it will make life much easier!